Start of an exciting new year and the exciting Yarraville Festival! Food, entertainment, stallholders, traders, community, live music and more. 9am to 7pm Sunday 17 Feb 2019. 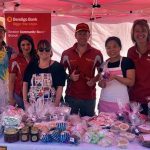 An integral Westside affair since 1981, The Yarraville Festival is an annual event that brings together people of the Inner West to celebrate and create a greater sense of pride and inclusiveness for all groups. The festival encourages a mixture of creative artists, designers, artisan stalls, activities and gourmet experiences that inspires a broader sense of community, whilst providing an economic stimulus for the local traders. This institutional festival embraces the cultural diversity, industrious nature and artistic air of the West, attracting over 25,000 people from all over Melbourne to join and experience the vibrant atmosphere.